Looking to inject some romance into the dark, dreary days of winter? Well, if you have to be cold, you may as well be cold in one of the most breathtaking landscapes in the Europe. What could be more romantic than treating your special someone to a weekend break (or longer) in the French Alps, complete with skiing, snuggling around an open fire, long strolls in the snow, and plenty of pampering? Nothing. And if you choose the lovely village of Soldeu, you’ll barely have to lift a finger to impress your love. Depending on how serious you both are about your skiing it can be romantic or quite competitive! As part of the Granvalira region, around Soldeu you’ll find some of the best skiing in Andorra for beginners and intermediates. 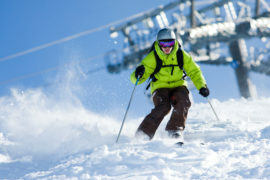 There are plenty of tips out there about Soldeu’s pistes, but for the romance chasers, here’s a little something extra. 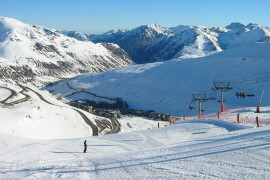 Take the Funicamp cable car (at the top of the beginner’s piste) to Encamp, then head across to Coll Blanc. 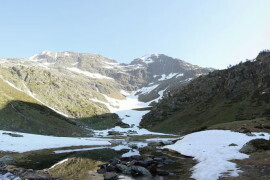 At Grau Roig, which is halfway between Soldeu and Pas de Casa, make a stop at the Llac del Pessons restaurant, which sits on the edges of a frozen lake at an altitude of 2300m. Amid the gorgeous stone and timber décor overlooking the lake, share a jug of their famous hot chocolate, and if your partner wasn’t in love with you before, they will be after that! Llac del Pessons is open from 9am-5pm every day and selected evenings with a booking. What’s a romantic getaway without a little (or a lot) of pampering? There are some fabulous wellness centres in Soldeu, many of which are attached to the large hotels. The SportWellness Mountain Spa, for example, welcomes guests and visitors to experience five levels of luxury pampering – and what an experience it is. For a total indulgence, book in for a full-day and enjoy a couples’ massage, open-air hydrotherapy baths with views of the slopes, a huge range of ayurvedic beauty and health treatments, underwater massage, and an extensive menu of other therapies using ingredients unique to the Pyrenees. Money may not be able to buy you love, but a pamper session here will certainly gain you some brownie points with your loved one. SportWellness Mountain Spa is part of the Sport Hotel Hermitage, the only 5-star accommodation in Soldeu. Bookings are necessary and it is open Mon-Sat 9-5, or by special appointment. For the ultimate loved-up accommodation, how does a cosy night in an igloo rate on the romance-o-meter? You’ll have the chance to test the theory at the Granvalira Igloo Hotel, just outside Soldeu, and while you probably won’t want to spend your entire stay there, it makes a wonderful surprise treat. The Granvalira Igloo Hotel is just up the road from Soldeu at Grau Roig and is rebuilt every year. Bookings are essential, and enquiries for this year’s availability and prices can be made at +34 902 550 435. If you’re looking, love is all around you in Soldeu, with plenty of romantic restaurants, luxury accommodation, cosy nook bars and, of course, that jaw-dropping magical winter landscape. 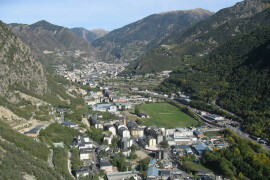 When you visit Andorra you’ve got the option of flying into a number of airports in France or Spain, including Toulouse, Barcelona, Perpignan and Reus. Transfers from any of these airports are a cinch, and if you book with Shuttle Direct, a driver will meet you at the airport and transfer you straight to Soldeu, without having to wait around and navigate public transport. If you fly into Reus, the 3.5-hour transfer is actually romantic interlude in itself, taking in the picturesque mountainous route through Andorra. If you’re driving to Andorra, you’ll have to be confident behind the wheel (and ensure you have snow chains), as the roads can be difficult when covered in snow and ice, especially when coming from the French side through the Tunel d’Envalira. If you’re coming via Spain, take the C14 motorway before switching to the N145 when you reach Andorra, then through the mountain pass to Soldeu. La Pleta de Soldeu Apartments – Romance doesn’t have to cost the world and the cute and cosy La Pleta de Soldeu Apartments, complete with its own tower, proves just that. With warm timber décor throughout and stunning views of the snow-covered mountains, your studio or apartment pied-a-terre is just footsteps from the slopes and the restaurants of Soldeu. There are plenty of reasons for a night in too, with your own kitchenette and a romantic balcony to stargaze. Hotel Xalet Montana – With an old world, traditional Alpine ambience, the Hotel Xalet Montana spells romance both inside and out. Cosy up in front of the fireplace nook (under the gaze of a Cupid statue! ), enjoy a couples’ pamper session in the wellness centre, take a dip in the pool or hot tub, or simply relax in your spacious timber-clad room overlooking the winter wonderland beyond. Sport Hotel Hermitage & Spa – Opulent, luxurious and stylish beyond compare, the 5-star Sport Hotel Hermitage & Spa has everything you need for a memorable romantic winter holiday, including the therapy and treatment facilities of the Mountain Spa. Enjoy the indulgence of a cocktail in the stunning Glassbar overlooking the slopes, then dine in your choice of two onsite restaurants. Romance and luxury combine in the lavish décor of the rooms, where you’ll enjoy a spa, Egyptian cotton sheets, and a private balcony. Header image: “Soldeu desde el Tarter” by “bergaralphoto” Ramon Rodriguez Martinez. Licensed under CC BY 2.0. Julietta Henderson, Senior Editor and head of the writing team at LeadGeneratorsDigital, has over 20 years’ experience writing for the travel, tourism and photography industries. She has travelled extensively in New Zealand, Russia, North America, Canada, Britain, Ireland, Europe and Egypt, and has ‘lived like a local’ in Italy, France, the UK, and Australia. Julietta’s writing career includes publications in magazines, newspapers, industry journals, and online publications, and she has proudly authored four travel photography books. Her passions include travel, writing, photography, art history and architecture. I Only Carry Hand Luggage. Will the Driver Be There as Soon as I Land?